After a month of the release of stable version of Manjaro Linux 16.06.1(Daniella),Manjaro Linux Team has announced the release of First preview of Manjaro Linux 16.08,which is going to be the next stable release after Manjaro Daniella.The new Manjaro linux 16.08 release has been codenamed as Ellada. If you are not aware with Manjaro Linux then you may need to read our Review of Linux Manjaro. 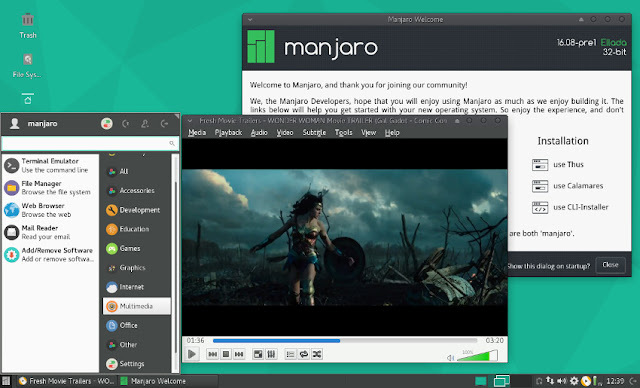 This preview release of Manjaro Linux has many changes over the previous version Daniella.With fixes on bugs(/issues),this also brings updated drivers,kernel and Software Packages as well.The KDE edition of Manjaro Ellada made space to bring more changes.Plasma 5.7 is here in the play mode, which is a recent release as well.Framework 5.24 and Apps 16.04 are being used to bring better user experience.Qt5 brought struggling time for the team but they were able to make it.Qt5 brings changes in handling GTK theming. Manjaro Settings Manger also got some fixes in terms of appearance and updated Translation has been included. Manjaro Linux Ellada is available for both 32-bit and 64-bit users.Available in the flavour of,as always KDE and XFCE.